Born to a Surinamese father and a Dutch-Indonesian mother, De Jong will line up for his seventh club across six different countries if he makes his Mainz debut against Hannover at the HDI Arena next Saturday afternoon as expected. 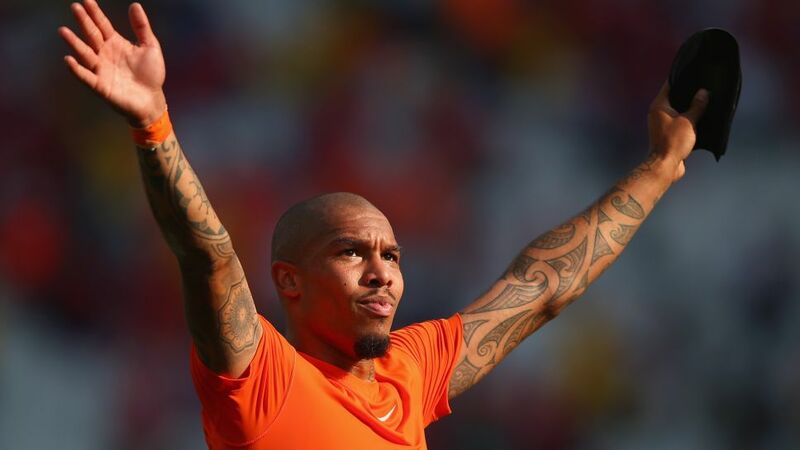 De Jong already counts Ajax, Hamburg, Manchester City, AC Milan, LA Galaxy and Galatasaray on his footballing resume, and has won league titles in the Netherlands and England along the way. De Jong may have long since earned a reputation as one of the most feared midfield enforcers in world football, but he began his career much further up the pitch. De Jong played just shy of 100 games at first club Ajax, winning the Dutch Eredivisie title in 2004 as well as the Johan Cruyff Shield and AFC Ajax Player of the Year in 2005, but he did so as a creative midfielder and even a forward. It wasn’t until 2007 that he was converted at Hamburg under the watchful eye of compatriot Huub Stevens. Back-to-back European finishes for the Bundesliga’s only ever-present club followed. With 10 years of shielding the defence under his belt, De Jong has nonetheless reached 21 senior professional goals. Quality, not quantity, is De Jong’s modus operandi, though. He scored his first ever goal at the age of 18, ensuring a 1-1 draw for Ajax against Arsenal in the UEFA Champions League; sealed HSV’s winner when they inflicted upon Bayern their first ever defeat in the Allianz Arena in March 2006; bagged his first and only international tally against Iceland to book the Netherlands’ ticket to South Africa in 2010; and scored the winner for Milan against Inter in the Derby della Madonnina in May 2014. Born on 30 November 1984, De Jong shares a birthdate with the first ever international football match, contested between Scotland and England at Hamilton Park Crescent in Glasgow back in 1872. Gary Lineker, winner of the Golden Boot at the 1986 World Cup and now the presenter of Match of Day, was also born on this day in 1960, while his first day was Evel Knieval’s last in 2007 – the American stuntman who passed away at 69 after a daring career that would have made even De Jong wince. He may have enjoyed a glittering sporting career, with a business one that seems set to follow, but De Jong remains as humble as they come. One bundesliga.com correspondent shared a flight with the player from Manchester to Munich in 2012. De Jong flew economy class, with priority boarding the only extra he was compelled to order. In terms of ability, experience and attitude, Mainz may just have signed the very man they need to motor away from the relegation places in the Rückrunde. Click here for more Mainz news, views and features!